Anticorrosive quick-drying primer for all kinds of surfaces. Excellent adhesion on a great variety of materials. TITAN Synthetics Thinner, Universal Thinner or Cleaning Thinner. Product list 804- MULTI PURPOSE PRIMER 804. 113-(ENG) DECAPANTE LÍQUIDO. 121-A1 EXTRA EMULSION PAINT * SERVICOLOR BASE * PREMIER GREEN LINE. 121-A1 EXTRA EMULSION PAINT * SERVICOLOR BASE * PREMIER GREEN LINE. 121-A1 EXTRA EMULSION PAINT * SERVICOLOR BASE * PREMIER GREEN LINE. 075-ABLATIVE VINYL ANTIFOULING. 170-ACRYLIC EMULSION PAINT TP2000. 123-ACRYLIC EMULSION PAINT TP23. 092-ACUALUX TITAN. 099-ACUALUX TITAN. 118-AISLASOL D-17. 875-ALKYD THINNER 875. 878-ALL PURPOSE THINNER 878. 05B-ALL-PURPOSE WHITE ADHESIVE. 07X-ALUMINIUM PRIMER. H22-ANTI MOULD PRESERVATIVE PAINT H22 . 076-ANTICORROSIVE EPOXY PRIMER. 07E-ANTIFOULING FOR FISHING BOATS. H11-BARRIER AGAINST SALTPETRE H11. 088-BLANCDUR. S2B-BLUING OXIRON. 02B-BLUING OXIRON. 872-CHLORINATED RUBBER THINNER 872. S12-CHROME EFFECT ENAMEL. S47-CHROME EFFECT PROTECTIVE VARNISH. S44-CLEAR SPECIAL VARNISH FOR METALLIZED SURFACES. 119-COLORLUX SYNTHETIC ENAMEL SERVICOLOR BASE. 119-COLORLUX SYNTHETIC ENAMEL SERVICOLOR BASE. 906-COLOURANTS * GREEN LINE PREMIER SERVICOLOR SYSTEM (ECO-RANGE)	. H30-COLOURLESS WATER REPELLENT PRODUCT H30. 019-DAMP PREVENTIVE PAINT H25. 129-DECK WATERPROOFING COATING A8. 12F-DECK WATERPROOFING FIBERED COATING A8. 10E-E1 ENVIRONMENTALLY-FRIENDLY EMULSION PAINT . 124-EMULSION PAINT A3. 125-EMULSION PAINT FOR FAÇADES A4. 07D-ENAMEL FOR FISHING BOATS. 120-ENAMEL LACQUER COLORLUX. V38-ENVIRONMENTALLY-FRIENDLY WAX-LIKE ASPECT VARNISH. 079-EPOXY FILLER. 837-EPOXY PAINT FOR FLOORS 837. 837-EPOXY PAINT FOR FLOORS 837 SERVICOLOR BASE. 837-EPOXY PAINT FOR FLOORS 837 SERVICOLOR BASE. 832-EPOXY PRIMER 832. 833-EPOXY TAR 833. 873-EPOXY THINNER 873. 121-EXTRA EMULSION PAINT A1. 813-EXTRA OUTDOOR SYNTHETIC ENAMEL 813. 813-EXTRA OUTDOOR SYNTHETIC ENAMEL 813 SERVICOLOR BASE. 813-EXTRA OUTDOOR SYNTHETIC ENAMEL 813 SERVICOLOR BASE. 126-FAÇADE SMOOTH COATING A5. 126-FAÇADE SMOOTH COATING A5. 143-FIXATIVE BASE COATING D13. H10-FIXATIVE UNDERCOAT H10. S05-FLUORESCENT PAINT. 867-GALVANIC PRIMER 867. 803-GALVANIZING GREY PRIMER HIGH ZINC CONTENT 803. S80-GRAFFITI REMOVER. S2D-HAMMERED OXIRON. 02D-HAMMERED OXIRON. S09-HEAT-RESISTANT PAINT. 030-HIDRALUX. 056-HIDROLIN. 142-IMPRIMOL SYNTHETIC SEALER D12. 106-INVISIBLE WATER REPELLENT A95. 838-IRON OXIDE EPOXY PRIMER 838. 07V-LOW DENSITY EPOXY FILLER. 07T-M150 THICK COAT EPOXY PRIMER. 07N-MARINE PRIMER. 14D-MAXI GLOSS WAX. S40-METAL PROTECTIVE VARNISH. 811-METALLIC PAINT 811. 811-METALLIC PAINT 811 SERVICOLOR BASE. S08-METALLIZED ENAMEL. 818-METALLIZED ENAMEL 818 SERVICOLOR BASE. 03M-METALLIZED TITANLUX IDEAS. H41-MOULD REMOVER H41. 179-MULTI ADHESION RUST PREVENTIVE PRIMER D75. 122-MULTI PLASTER PAINT A22. S63-MULTI PURPOSE PRIMER. 07U-MULTI-PURPOSE RUST REMOVER. 175-NON CRACKING COATING A14. 08S-ODOURLESS THINNER. 841-OUTDOOR POLYURETHANE 841. 841-OUTDOOR POLYURETHANE 841 SERVICOLOR BASE. 841-OUTDOOR POLYURETHANE 841 SERVICOLOR BASE. 841-OUTDOOR POLYURETHANE 841 SERVICOLOR BASE. 135-OUTDOOR VARNISH D8. 07C-OUTDRIVE ANTIFOULING. S21-PAINT FOR SIGNALLING AND MARKING. 871-PHOSPHATIZING WASH PRIMER 871. 072-POLYESTER FILLER. 830-POLYLUX EPOXY PRIMER 830. 840-POLYLUX LUMINESCENT POLYURETHANE 840. 840-POLYLUX POLYURETHANE 840. 840-POLYLUX POLYURETHANE 840 SERVICOLOR BASE. 840-POLYLUX POLYURETHANE 840 SERVICOLOR BASE. 078-POLYURETHANE + ACRYLIC ENAMEL. 078-POLYURETHANE + ACRYLIC ENAMEL. 843-POLYURETHANE ENAMEL 843. 843-POLYURETHANE ENAMEL 843 SERVICOLOR BASE. 843-POLYURETHANE ENAMEL 843 SERVICOLOR BASE. 843-POLYURETHANE ENAMEL 843 SERVICOLOR BASE. 844-POLYURETHANE ENAMEL 844 SERVICOLOR BASE. 844-POLYURETHANE ENAMEL 844 SERVICOLOR BASE. 150-POLYURETHANE SATIN ENAMEL D4. 874-POLYURETHANE THINNER 874. 137-POLYURETHANE VARNISH D9. 07A-POLYURETHANE+ACRYLIC VARNISH. 07L-POLYURETHANE+ACRYLIC VARNISH. 104-PREMIUM VINYL PAINT A60. H40-PRESERVATIVE FOR PAINT FILMS H40. S62-PRIMER FOR GALVANIZED SURFACES. 086-PURE TURPENTINE. 810-QUICK DRYING ENAMEL 810. 810-QUICK DRYING ENAMEL 810 SERVICOLOR BASE. 810-QUICK DRYING ENAMEL 810 SERVICOLOR BASE. 810-QUICK DRYING ENAMEL 810 SERVICOLOR BASE. 817-QUICK DRYING ENAMEL 817. 817-QUICK DRYING ENAMEL 817 SERVICOLOR BASE. 817-QUICK DRYING ENAMEL 817 SERVICOLOR BASE. 817-QUICK DRYING ENAMEL 817 SERVICOLOR BASE. S00-RAL COLOUR ACRYLIC ENAMEL. 07F-RED LEAD. 815-RUST PREVENTIVE ENAMEL 815. 815-RUST PREVENTIVE ENAMEL 815 SERVICOLOR BASE . 815-RUST PREVENTIVE ENAMEL 815 SERVICOLOR BASE . 831-RUST PREVENTIVE EPOXY PRIMER 831. 105-RUST PREVENTIVE MULTI PURPOSE WATER BASED PRIMER A90. S60-RUST PREVENTIVE PRIMER. 802-RUST PREVENTIVE PRIMER 802. H42-SALTPETRE REMOVER H42. 814-SATIN ENAMEL 814 SERVICOLOR BASE. 814-SATIN ENAMEL 814 SERVICOLOR BASE. 814-SATIN ENAMEL 814 SERVICOLOR BASE. 07S-SELF-POLISHING ANTIFOULING. 06L-SELF-POLISHING LIXIVIATING ANTIFOULING. 07K-SELF-POLISHING UNIVERSAL ANTIFOULING. HIGH SPEED.. 07M-SELF-POLISHING UNIVERSAL ANTIFOULING. MEDIUM SPEED.. 124-SERVICOLOR PREMIER ECO-RANGE BASE A-3. SATIN EMULSION PAINT. 124-SERVICOLOR PREMIER ECO-RANGE BASE A-3. SATIN EMULSION PAINT. 124-SERVICOLOR PREMIER ECO-RANGE BASE A-3. SATIN EMULSION PAINT. 125-SERVICOLOR PREMIER ECO-RANGE BASE A-4. EMULSION PAINT FOR FAÇADES. 125-SERVICOLOR PREMIER ECO-RANGE BASE A-4. EMULSION PAINT FOR FAÇADES. 125-SERVICOLOR PREMIER ECO-RANGE BASE A-4. EMULSION PAINT FOR FAÇADES. 171-SERVICOLOR PREMIER ECO-RANGE BASE A-9. STONE-LIKE SMOOTH COATING. 171-SERVICOLOR PREMIER ECO-RANGE BASE A-9. STONE-LIKE SMOOTH COATING. 171-SERVICOLOR PREMIER ECO-RANGE BASE A-9. STONE-LIKE SMOOTH COATING. 030-SERVICOLOR PREMIER ECO-RANGE BASE HIDRALUX . 030-SERVICOLOR PREMIER ECO-RANGE BASE HIDRALUX . 030-SERVICOLOR PREMIER ECO-RANGE BASE HIDRALUX . 031-SERVICOLOR PREMIER ECO-RANGE BASE TITAN EXPORT . 031-SERVICOLOR PREMIER ECO-RANGE BASE TITAN EXPORT . 031-SERVICOLOR PREMIER ECO-RANGE BASE TITAN EXPORT . 014-SERVICOLOR PREMIER ECO-RANGE BASE TITANIT FAÇADES. 014-SERVICOLOR PREMIER ECO-RANGE BASE TITANIT FAÇADES. 014-SERVICOLOR PREMIER ECO-RANGE BASE TITANIT FAÇADES. 029-SERVICOLOR PREMIER ECO-RANGE BASE TITANIT. MATT . 029-SERVICOLOR PREMIER ECO-RANGE BASE TITANIT. MATT . 011-SERVICOLOR PREMIER ECO-RANGE BASE TITANLAK. LACQUER. 011-SERVICOLOR PREMIER ECO-RANGE BASE TITANLAK. LACQUER. 011-SERVICOLOR PREMIER ECO-RANGE BASE TITANLAK. LACQUER. 001-SERVICOLOR PREMIER ECO-RANGE BASE TITANLUX. SYNTHETIC ENAMEL. 001-SERVICOLOR PREMIER ECO-RANGE BASE TITANLUX. SYNTHETIC ENAMEL. 001-SERVICOLOR PREMIER ECO-RANGE BASE TITANLUX. SYNTHETIC ENAMEL. 123-SERVICOLOR PREMIER ECO-RANGE BASE TP-23. MATT EMULSION PAINT. 123-SERVICOLOR PREMIER ECO-RANGE BASE TP-23. MATT EMULSION PAINT. 865-SHOP PRIMER 865. 174-SILICONE BASED PAINT FOR FAÇADES A13. 02C-SMOOTH OXIRON. 02L-SMOOTH OXIRON GLOSS WATER BASED. S2J-SMOOTH OXIRON RUST-PREVENTIVE PAINT. 02J-SMOOTH OXIRON SATIN. 171-SMOOTH STONE LIKE COATING A9. S7V-SPRAY MARINE PRIMER. 805-SR PRIMER 805. 805-SR PRIMER 805 SERVICOLOR BASE. 805-SR PRIMER 805 SERVICOLOR BASE. 806-SR RUST PREVENTIVE PRIMER 806. H24-STAIN ISOLATING PAINT H24. S10-STAIN-COVERING PAINT. 07Y-SUPER-SANDABLE ACRYLIC PRIMER. 177-SUPERSATIN EMULSION PAINT A11. 807-SYNTHETIC PRIMER B 807. 807-SYNTHETIC PRIMER B 807 SERVICOLOR BASE. 816-SYNTHETIC ENAMEL 816 SERVICOLOR BASE . 816-SYNTHETIC ENAMEL 816 SERVICOLOR BASE. 119-SYNTHETIC ENAMEL COLORLUX . 131-SYNTHETIC VARNISH D7. 07B-TEAK OIL. 074-THINNER. 083-THINNER FOR TITAN SWIMMING POOL PAINTS. 190-TINTORETTO EARTH EFFECT . 176-TINTORETTO VENETIAN STUCCO. 148-TITAN PATINA EFFECT VARNISH. S81-TITAN 8 SOLUTIONS. 052-TITAN ALKYD PASTE FILLER. 007-TITAN ALUMINIUM HEAT-RESISTANT ENAMEL. 006-TITAN ALUMINIUM OUTDOOR ENAMEL. 880-TITAN ANTIGRAFFITI PRIMER 880. 881-TITAN ANTIGRAFFITI VARNISH 881. 026-TITAN BATHROOMS AND KITCHENS. 09J-TITAN CHALK PAINT. 08L-TITAN CLEANING THINNER. 05E-TITAN COMPACTADOR. 082-TITAN CONCENTRATED LIQUID DRIER. 031-TITAN EXPORT DECORATION. 02E-TITAN FOR BATHROOMS AND KITCHENS TILE ENAMEL. 022-TITAN FOR SWIMMING POOLS. 01B-TITAN FOR WRITING BOARDS. 04A-TITAN FURNITURE RESTORER. 114-TITAN GEL STRIPPER. 01C-TITAN HEAT RESISTANT PAINT. 065-TITAN IRON MINIUM. 04B-TITAN METAL PROTECTIVE VARNISH. 059-TITAN MR THINNER. 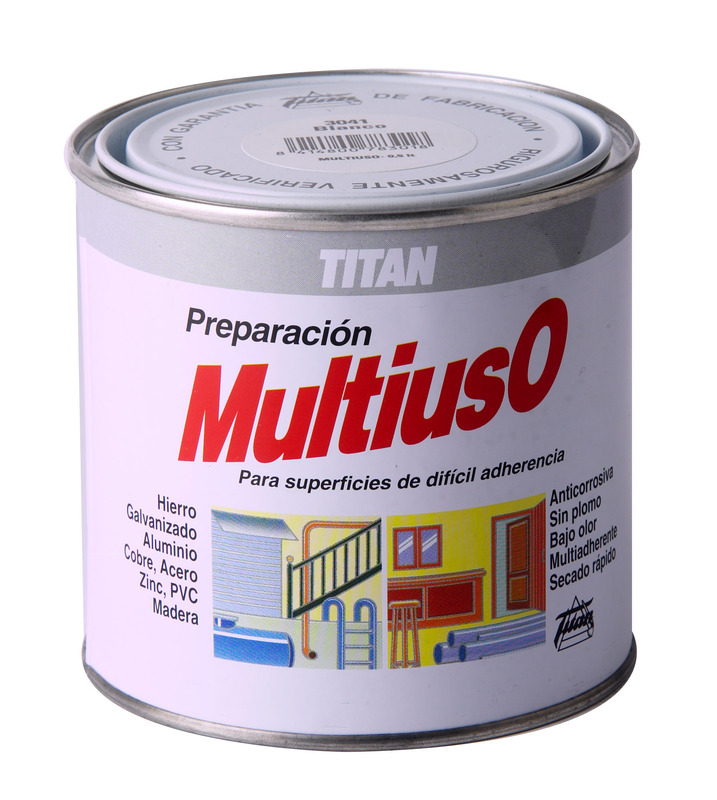 06A-TITAN MULTI PURPOSE PRIMER. 008-TITAN ORO ENAMEL. 039-TITAN OUTDOOR VARNISH. 023-TITAN PAINT FOR FLOORS. 02A-TITAN PAINT FOR TRAFFIC SIGNALLING. 05D-TITAN PAINT STRIPPER PLUS. 03S-TITAN PARKINGS. 049-TITAN PROTECTOR FOR WOOD. 050-TITAN SEALING PRIMER. 069-TITAN SINGLE COAT. 180-TITAN SIRENA. 060-TITAN SYNTHETIC PRIMER. 172-TITAN TEXTURED COATING A10. 085-TITAN THINNER. 08U-TITAN UNIVERSAL THINNER. 089-TITAN UNIVERSAL TINTING COLOURS. 043-TITAN VARNISH FOR WOODEN FLOORS. 044-TITAN VARNISH FOR WOODEN FLOORS. 03W-TITAN VELVET WATER-BASED ENAMEL FOR WALLS. 06P-TITAN WATER BASED MULTI PURPOSE PRIMER. 05A-TITAN WATER-BASED CRACK FILLER. 05F-TITAN WATER-BASED SEALING PRIMER. 087-TITAN WHITE SPIRIT. 856-TITAN WHITENING PAINT 856. 045-TITAN YATE MARINE VARNISH. 07Z-TITAN YATE POLYURETHANE VARNISH. 117-TITANIA D15. 029-TITANIT DECORATION. 014-TITANIT FAÇADES. 012-TITANIT INDOOR-OUTDOOR. S02-TITANLAK ENAMEL LACQUER. 042-TITANLAK LACQUER-VARNISH. 011-TITANLAK POLYURETHANE ENAMEL. 024-TITANLAK. WOOD EFFECT. S41-TITANLUX ALKYD VARNISH. S42-TITANLUX ALKYD VARNISH. 00C-TITANLUX ENAMEL CERAMIC-LIKE FINISH. 00C-TITANLUX ENAMEL. CERAMIC-LIKE FINISH. 05T-TITANLUX FLEXIBLE FILLER CONTAINING FIBRE. 081-TITANLUX GLOSS REDUCING AGENT. 080-TITANLUX LIQUID POLISH. 016-TITANLUX READY-TO-USE MATT. 010-TITANLUX RUST-PREVENTIVE ENAMEL POLYURETHANE CREAM. 001-TITANLUX SYNTHETIC ENAMEL. 001-TITANLUX SYNTHETIC ENAMEL. S01-TITANLUX SYNTHETIC ENAMEL. 001-TITANLUX SYNTHETIC ENAMEL SILVER. 062-TITANLUX SYNTHETIC RUST PREVENTIVE PRIMER. 036-TITANLUX SYNTHETIC VARNISH. 035-TITANLUX SYNTHETIC VARNISH. 034-TITANLUX SYNTHETIC VARNISH. 06T-TITANLUX TOTAL COVERAGE – PAIL. 06T-TITANLUX TOTAL COVERAGE – RECTANGULAR BUCKET. 040-TITANLUX VARNISH STAIN. POLYURETHANE CREAM. 037-TITANLUX VARNISH-STAIN FOR WOOD. 03R-TITANLUX VARNISH-STAIN FOR WOOD. 04C-TITANLUX VARNISH. CRYSTAL FINISH. 04G-TITANLUX WATER BASED OUTDOOR VARNISH. 04H-TITANLUX WATER BASED OUTDOOR VARNISH. 01T-TITANLUX WATER-BASED ECO FRIENDLY ENAMEL. 02T-TITANLUX WATER-BASED ECO-FRIENDLY ENAMEL. 00T-TITANLUX WATER-BASED ECO-FRIENDLY ENAMEL. 04J-TITANLUX WATER-BASED VARNISH FOR WOODEN FLOORS. 04E-TITANLUX WATER-BASED VARNISH STAIN. 04F-TITANLUX WATER-BASED VARNISH STAIN DECO. 04Q-TITANXYL LASUR AUTOCLAVE EFFECT. 046-TITANXYL LASUR COLOUR. 04N-TITANXYL LASUR NATURAL. 047-TITANXYL LASUR UNDERCOAT ULTRA. 04S-TITANXYL PROTECTION TOTAL ULTRA. 04P-TITANXYL TEAK OIL. 04R-TITANXYL TECAGEL. 04M-TITANXYL WATER BASED LASUR COLOUR. 04Z-TITANXYL WATERBASED WOODWORM TREATMENT. 04D-TITANXYL WOOD WORM TREATMENT PLUS. 04T-TITANYXL LASUR COLOUR. 100-TOP DECORATION EMULSION PAINT A100. 860-TRAFFIC SIGNALING PAINT 860. 03X-UNILAK MATT SERVICOLOR BASE. 03X-UNILAK MATT SERVICOLOR BASE. 03Z-UNILAK UNIVERSAL ENAMEL. 03F-UNILAK UNIVERSAL ENAMEL. 03X-UNILAK UNIVERSAL ENAMEL. 130-UNIVERSAL VARNISH D6. 077-URETHANE BASED ENAMEL. 876-WASH PRIMER THINNER 876. 136-WATER - BASED DYE. 162-WATER BASED ACRYLIC FIXATIVE A19. 02S-WATER BASED ENAMEL FOR KITCHEN AND BATHROOM TILES TITANLUX. 01P-WATER BASED ENAMEL FOR WRITING BOARDS SERVICOLOR BASE TITANLUX. 01P-WATER BASED ENAMEL FOR WRITING BOARDS TITANLUX. 02K-WATER BASED ENAMEL TILES TITANLUX. 836-WATER BASED EPOXY PAINT 836. 835-WATER BASED EPOXY PAINT FOR FLOORS 835. 145-WATER BASED SEALING PRIMER A18. 149-WATER BASED SILOXANE FIXATIVE A16. 08W-WATER BASED TINTING COLOUR. 161-WATER REPELLENT PAINT D-14. 17A-WATER-BASED AISLASOL A-17. 06G-WATER-BASED PAINT STRIPPER FOR ANTIFOULINGS. 102-WATERBASED INTUMESCENT PAINT A80. 103-WATERBASED INTUMESCENT PAINT A85. 03E-WATERPROOFING COATING H23. S03-WHITE ENAMEL FOR ELECTRICAL APPLIANCES. S61-WHITE RUST PREVENTIVE PRIMER. 020-WROUGHT OXIRON. *IMPORTANT: We inform you that the data which you voluntarily provide us with when you fill out this form will be incorporated into the file called BDGAIT. The data we ask for will be used in order to carry out the commission or order arising out of the current relationship between the company and yourself, and to notify you of all matters and news that may be of interest to you. Only people authorized by the entity responsible for this file, which is Industrias TITAN S.A.U., will have access to the file. In all cases Industrias TITAN S.A.U. recognises your rights to consult, access, totally or partially rectify, cancel, and when it is the case, in accordance with the current legislation, oppose and demand the exclusion of this data. If you so wish in order to effectively and urgently exercise the aforementioned rights, you can do this through this web, or if you prefer by writing to the postal address of the entity responsible, which is in Torre Auditori Planta 10, Paseo de la Zona Franca 111, 08038 Barcelona, from where they will provide you with the relevant official forms enabling you to carry out your intention. I agree to receive business communications and news which may be of interest to me. How many m2 do you need to paint? WARNING: The perception of colours may vary according to the configuration of each screen so the colours obtained are only for guidance.